By LUDWIG VON KOOPA - Or at least my first impression of playing it. You should know from the contest KoopaTV is holding, which is still going on and you're encouraged to enter it, that I bought Mario Kart 8. Well yesterday (Sunday) I finally got the chance to actually play it. Yes, I've been busy! It's not my first time seeing it in person, but... Now it's time to try to like the game. I immediately got the Koopa Troopa and King Bowser Koopa stamps, since those are the Koopas you start with. So, first impressions from playing it! I played every cup in 50CC except Special Cup, and got perfect 60s on them (three-star ratings) on... most of them. The game hides no secrets from you: They WANT you to unlock everything quickly. They showed the Tick Tock Clock stage in the opening cinematic if you leave the game on. I believe that Mario Kart: Double Dash!! did not show unlockable stuff to the player until they unlocked it. Not true for this game, which immediately has unlockable characters racing with you. (Such as... myself! And man, my CPU is bad. Guess it works since I'm pretty terrible at the series.) You can't play as them yet, but you unlock a new character (presumably randomly) every cup you finish. I still haven't unlocked myself! Since I'm playing 50CC, I felt there was no point where the highlight reel was really worth watching. Most of the time I skip it. Ain't gonna be highlights in a boring race, right? You can edit the highlight reel to focus on different characters/kinds of moments. Once I had a "highlight" reel of Morton who was in dead last in Tick Tock Clock. By far. I wanted to know what the hell he was doing in that race. Well, he spent it crashing into walls and stuff and spinning out! On that note, I organically figured out that you hold down accelerate when the race timer is at "2" to get a speed-boost! Courses that stood out: Electrodome, Mount Wario, Dry Dry Desert, and Sherbet Land. The latter two were going to stand out either way because they're the only returning Mario Kart: Double-Dash!! courses, and that's the only game in the series I'm really fond of. They put an oasis in the desert! And freezing water in Sherbet Land! The Freezies are a lot simpler to avoid, though. Electrodome has a cool theme going on, and I like what Mount Wario does with each "lap" basically being a different checkpoint on the map. They also did this with Rainbow Road N64, but Mount Wario literally made me say, "Oh, crap!" in the pre-race preview of the course. "We're going to race out of a plane?!" I'm only going to play with karts in this game, but I haven't seen anyone use a Wheelie on a bike. Based on the Nintendo Direct on the game, there are no Wheelies and bikes no longer ruin the game like Mario Kart Wii! That is an immediate improvement. This is my first Mario Kart with kart customization (for those keeping track, I've owned Mario Kart 64, Mario Kart: Double-Dash! !, Mario Kart Wii, and now this) and it seems pretty arbitrary so far since I'll win with whatever. Those coins from Super Mario Kart come back to give you a speed boost the more you have. You drop three of them if you get hit, like a Sonic game. Apparently you also get more kart customization options the more you collect, which makes being in first place by a mile a bit more interesting, actually. 'cause then you can still be doing things that help you out in the long... run. Mario Kart 8 wished it had this. The checklist. Not Meta Knight. Anti-gravity? Eh. Kirby could spin at will in Kirby Air Ride, which I wish you could do in this game. The whole game is so far inferior to Kirby Air Ride, actually. I actually think about that while I'm playing the game, which probably is not a good thing. 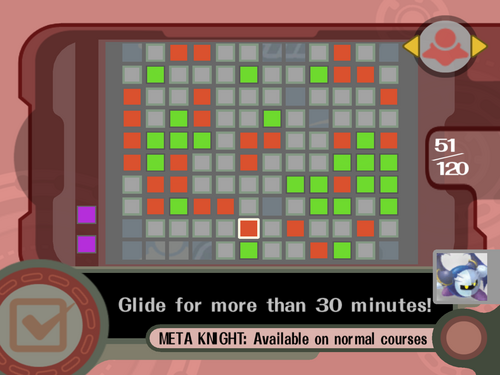 From what I can tell, Kirby Air Ride has more content, is more fun, and more stuff to complete. But hey, that was true of Mario Kart: Double-Dash!! vs. Kirby Air Ride as well. So I'll stop rambling here and... play more Mario Kart 8! If you're waiting for the last moment to get Mario Kart 8 before the Club Nintendo deal expires, eh, don't bother. Besides, you can always win that free game deal in KoopaTV's contest! I'm not impressed with the gravity feature in Mario Kart 8. 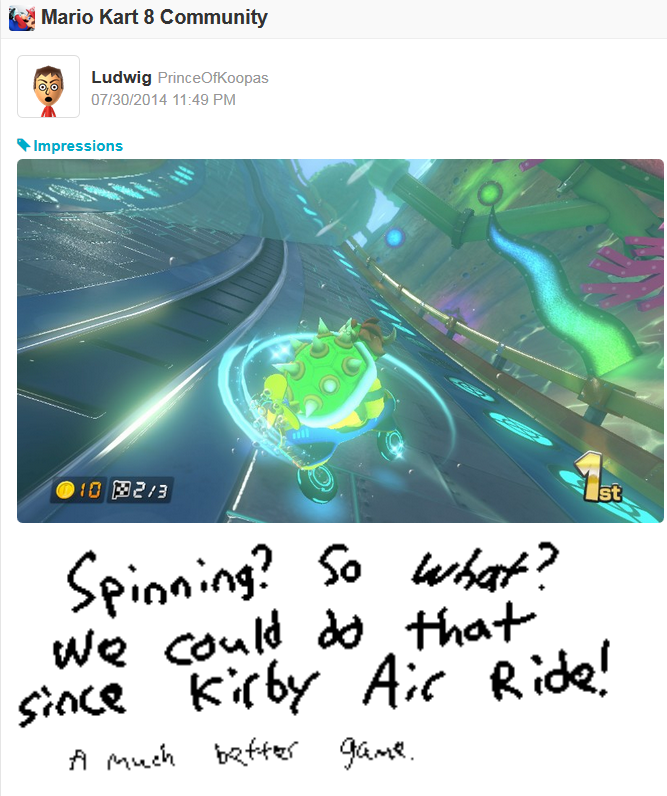 Three years since this post, I can safely say that Kirby Air Ride is MUCH, MUCH better than Mario Kart 8. Ludwig's NNID is PrinceOfKoopas. 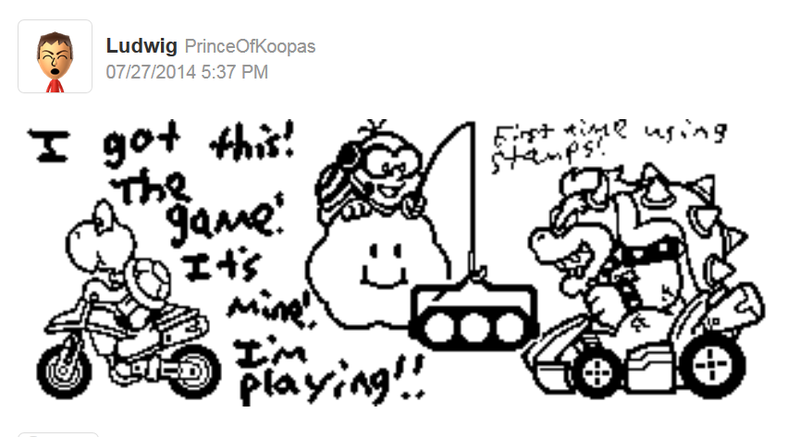 If you want to race him, you'll have to be Wii U friends with him first. ...He probably does not share your desire to want to race, though. In about a month, Ludwig's opinion of the game has gone to Reverse. Click here for more details. ...in the one and only time I played a cup. I should actually play again sometime. Hope I'm not, y'know, last. This game does indeed seem dull! But that does not stop me from wanting to pummel you so forcefully into last, it's as if Smash Bros came early! The coins appear in Super Circuit and Mario Kart 7 too! A lot of the courses in the Retro Cups are completely brand new to me, so that's cool. I just played Double-Dash!! today with three other friends. It was an absolute [Bob-omb] Blast. I don't see how Kart 8 can top that. Mario Kart: Double Dash!! reiteration! HD Double-Dash!! would be a better game than Kart 8. ...It's REALLY bad if I'm pessimistic about a new game while I'm playing it.